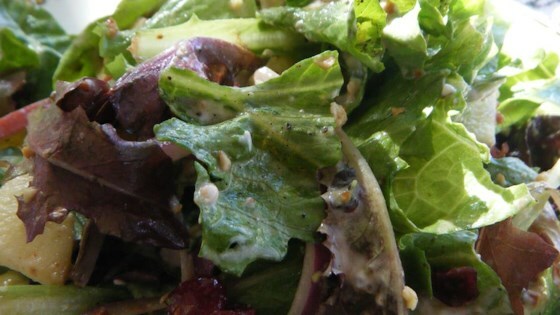 "Delicious salad that tastes like the III Forks salad (if you live in the Dallas area). It's an excellent salad that everyone will love, and it's very easy to make! " In a large salad bowl, mix the lettuce, green onions, apple, avocado, dried cranberries, blue cheese, and cooked almonds. Whisk together the vinegar, 2 teaspoons of sugar, and salt and pepper in a bowl, and stir in the vegetable oil. Pour the dressing over the salad, and gently toss to combine. Green leaf, pink lady, red wine vinaigrette. DELICIOUS! I stuck to the recipe exactly and it was a huge hit at our dinner party. Thanks!!! One of the best salads. I used Creamy poppyseed dressing instead. Everyone loves it. This is a huge favorite in our family. You can add cooked and shredded chicken to make it an entire luncheon meal. There was more dressing than the ratio of lettuce:dressing I prefer, but I added some baby spinach & it was perfect. I took it to a baby shower & got lots of compliments. Easy & delicious. WOW! Loved this, thanks for a great recipe.